Summary: Millions of people fantasize about leaving their old lives behind, enrolling in cooking school, and training to become a chef. But for those who make the decision, the difference between the dream and reality can be gigantic—especially at the top cooking school in the country. For the first time in the Culinary Institute of America’s history, a book will give readers the firsthand experience of being a full-time student facing all of the challenges of the legendary course in its entirety. I can't say exactly why BEATEN, SEARED, AND SAUCED: ON BECOMING A CHEF AT THE CULINARY INSTITUTE OF AMERICA by Jonathan Dixon appealed to me so much. 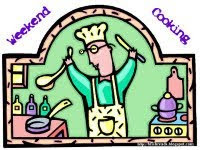 I like to eat and look at recipes, but I don't cook all that much; and I'd never dream of attending a culinary school. But for some reason, I was intrigued by BEATEN, SEARED, AND SAUCED. I wanted to know the inside scoop what it takes to train at The Culinary Institute of America. Let me just say that I am 100% sure that I don't have what it takes to become a chef at The CIA -- not even close. I figured the process would be daunting, but I had no idea how rigorous the training is. It was part in-depth college coursework and part Hell's Kitchen (the reality show with Gordon Ramsay.) This two-year program is beyond difficult especially to someone like me who can't even comprehend learning this much about cooking and wouldn't even be willing to try half the recipes. Students learn about everything from knife skills, to meats, to pastry making, to wine, and they also have a rigorous externship. 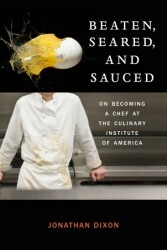 After reading BEATEN, SEARED, AND SAUCED, I have the utmost respect for anyone who could make it through this program. Of course, I was fascinated with everything that had to do with The CIA -- from the coursework, to the teachers, to the food, to the students; however, what made BEATEN, SEARED, AND SAUCED so interesting was how Mr. Dixon presented the information. Mr. Dixon was almost 40 years old when he decided that he wanted to train to be a chef -- that's way older than the average CIA student. He came with a background in writing and teaching, and he's even worked for Martha Stewart, so I felt as if his maturity and prior experiences made his insight into the school even more relevant. I also loved how he included many of his own trials -- whether is be his difficulties in a course, or his insecurities about his decision to start school at 40, or even his relationship issues with his girlfriend -- because these glimpses into his personal life made the book that much more special to me. Another thing that made BEATEN, SEARED, AND SAUCED so interesting to me were the anecdotal stories about the other students and the teachers. I thought the author did a great job of telling these stories and I found myself laughing a great deal at some of the larger-than-life personalities. I can see why the school administration needs a mix of teachers -- some tough and some more nurturing -- because it needs to make sure these students have what it takes to be a successful chef, but I would have been scared to death of most of them! If you've every dreamed about attending a culinary school or are like me and curious about what it takes to become a chef, then I definitely recommend BEATEN, SEARED, AND SAUCED. Thanks to the publisher for sending me a copy of this book. I'm definitely going to check this book out. If you liked this book, I would also recommend The Sharper Your Knife the Less You Cry by Kathleen Flinn. The story is almost identical but Flinn goes to Le Cordon Bleu in Paris instead of CIA. Carl has dreamed of going to culinary school and loves the cooking reality shows, so I bet he'd love this book. I know culinary school is not for me - I won't even cut up a whole chicken. The book sounds fascinating! Have you read Bill Buford's Heat? He doesn't go to culinary school but instead learns on the job in Mario Batali's restaurant Babbo. Oh, my Sister In Law went to CIA! She's an incredible pastry chef and an avid reader. I'll have to pass this on to her! I have read and enjoyed a few non-fiction books about working in the restaurant industry, and this one sounds good too! This sounds really good. I like books about chefs. I never realized how hard it was before I read a few! I've never read anything about a chef, but this book sounds really neat! This sounds so interesting! I have a close friend who trained at CIA, who always said that "Kitchen Confidential" is about as close to reality as it gets. I wonder what she'd think of this? Thanks for the recommendation, great review! This book definitely appeals to me! Oh this totally sounds like my type of book! I love food but I hardly cook. I would love to learn about cooking but I doubt I'd have what it takes to finish CIA! I love the sounds of this book. I'm curious and want to know all the behind the scenes info. I'm going to check my library for this one. It sounds fantastic! Thanks for the great review. This sounds fascinating! I have a good friend who is working in an office job right now but really wants to follow his dream of going to cooking school - I am going to recommend this to him.